Despite the ruling party’s recent electoral victory, President Park’s domestic critics continue to gain ground. Despite the Saenuri Party holding its ground in the gubernatorial and mayoral elections earlier this month, the surprising show of public support for the ruling party has not translated into smooth sailing for the Park Geun-hye administration. In particular, several cabinet posts remain vacant as the National Assembly’s confirmation hearings for Park’s nominees have proven to be far more challenging than expected. Finding a replacement for Prime Minister Jung Hong-won, who resigned in April over the government’s handling of the Sewol ferry disaster, has been especially difficult. President Park’s first choice as Jung’s replacing, Ahn Dae-hee, withdrew from consideration after coming under criticism for what many viewed as his excessive income. In response, the Park administration made the surprising decision to nominate Moon Chang-keuk, the former editor-in-chief of the local newspaper Joongang Daily, to be the next prime minister. 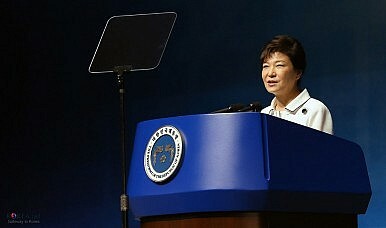 Given that he was not even initially discussed as a possible candidate, many believe that President Park nominated Moon because she believed his lack of government experience, combined with his limited exposure to corporations, would allow his nomination to sail through the confirmation process. In actuality, Moon’s nomination has not been without its critics. Many accused President Park of using the nomination to win back Moon’s home province of North Chungcheong, which had supported the opposition in the most recent gubernatorial race. Others questioned Moon’s ability to carry out the responsibilities of the office. After all, he may have written about politics, but, as Moon himself admitted, he has no experience whatsoever in politics or governance. Much of the condemnation was directed at President Park’s Chief of Staff Kim Ki-choon, who is believed to be the main proponent of these nominations. Born in 1939, Kim is older than the Republic of Korea itself. He started his career in the Ministry of Justice where he was instrumental in drafting the 1972 Yushin constitution that granted dictatorial powers to President Park Chung-hee. He later served as the Minister of Justice under the Roh Tae-woo government and was elected to a national assembly seat, running on a Grand National Party (the former name of the Saenuri Party) ticket for three consecutive terms between 1996 and 2008. Despite his controversial career, Kim is incredibly influential within the Saenuri Party and extremely well-connected, drawing on his long involvement in politics and his role in helping past conservative candidates win presidential elections. At the same time, he is intensely unpopular in some circles. He has been frequently criticized by the opposition for allegedly being a remnant of South Korea’s pre-1987 military dictatorship and for placing a person’s ideological orientation and political connections above his or her skills. Regarding the surprise nomination of Moon Chang-keuk, a spokesperson for the NPAD speculated that the conservative journalist was likely handpicked by Kim for his political views and personal ties. It is not just the opposition that is unhappy with Kim, however. According to a public opinion poll conducted by Munhwa Daily, of the 1,000 people surveyed nationwide, 52.4% supported his removal from office. Even politicians within the ruling party have taken issue with some of the chief of staff’s behavior. In a carefully worded response during a radio interview, Saenuri national assemblyman Kim Mu-seong noted that while the ultimate decision lies with the president, he would support the appointment of a different chief of staff. He went on to criticize the hierarchical relationship that Kim Ki-choon established between the Blue House and the Saenuri Party, revealing significant rifts between the legislature and the executive. This bodes poorly for South Korea. The NPAD, public at large, and even several members within the Saenuri Party’s mounting criticism of Park’s nominations and personnel will imperil her ability to govern. In particular, with a growing number of people calling for Kim Ki-choon’s resignation, political developments in South Korea will be well worth following in the next few weeks. S. Korean PM Nominee: Japan’s Occupation Was ‘God’s Will’Korea’s Ruling Party Largely Unscathed After Local ElectionsSocial Media Manipulation of Public Opinion in Korean ElectionsSouth Korean Constitutional Court Unanimously Upholds Park Geun-hye ImpeachmentWhat's Next for South Korea's Center-Right?